The visit/walk is 1.5 hours long and available only by appointment. The cost is only $15 per person, but family and group rates are also available. They are very flexible and are more than happy to customize visits to their guest's wishes. 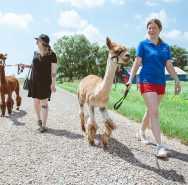 In the past, they have had extensive picnics where the alpacas come and visit, a surprise marriage proposal, and photo shoots for Christmas cards.